(Nanowerk News) Physicists have found a way to control the length and strength of waves of atomic motion that have promising potential uses such as fine-scale imaging and the transmission of information within tight spaces. The researchers measured waves called polaritons that can emerge when light interacts with matter. By combining two materials, they produced hybrid polaritons that propagate throughout many layers of a crystalline material and can be controlled with a simple electrical gate. The team, led by Dimitri Basov and Michael Fogler, professors of physics at the University of California, San Diego, report their success in Nature Nanotechnology ("Graphene on hexagonal boron nitride as a tunable hyperbolic metamaterial"). "Our work demonstrates new properties of polaritonic waves can be achieved by artificially combining different materials," said Siyuan Dai, a graduate student in Basov's group responsible for much of the experimental work, and the lead author of the report. "The hybrid polaritons are stronger and can propagate longer and thus have greater potential in applications." This collaborative team was one of two to first demonstrate polaritons in single-atom layers of carbon called graphene. In graphene, infrared light launches ripples through the electrons at the surface of this metal-like material called surface plasmon polaritons that the researchers were able to control using a simple electrical circuit. Infrared light can also launch polaritons within a different type of two-dimensional crystal called hexagonal boron nitride. Waves of atomic motion called phonon polaritons propagate throughout slabs of hBN formed by stacks of the sheetlike crystals. Basov's and Fogler's research groups have previously shown that varying the number of layers of hBN could control the waveform of the phonon polaritons. Once fabricated though, a device made of hBN would confine phonon polaritons to a single narrow range of wavelengths and amplitudes. 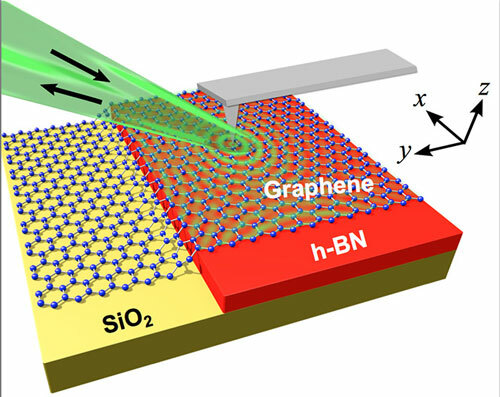 By topping a stack of hBN with a single layer of graphene, the team has created an agile new material with hybrid polaritons that propagate throughout the crystalline slab but can be tuned with an electronic gate. The two kind of polaritons become coupled, a theoretical consideration determined and experimental evidence confirmed. As a result, this human-made material manipulates electromagnetic radiation - light - in ways never observed in natural materials. It fits the definition of a metamaterial, a class of structures first realized at UC San Diego 15 years ago that is beginning to be expoited for potential practical use. "Our structures are made from the new wonder material graphene and its cousin boron nitride, which endow them with several advantages compared to traditional metal-based metamaterials. The key advantages include enormous degree of tunability, relatively low losses, and ultrasmall thickness," Fogler said. "We have now demonstrated an entirely new class of electromagnetic metamaterials that are fabricated from separate atomic planes of van der Waals materials," Basov said. "Electromagnetic metamaterials are revolutionizing imaging and sensor technologies. Since the initial demonstration these systems have already advanced to practical applications."